I just love coconut yoghurt. It’s creamy, tangy and rich, low in carbohydrates and high in healthy medium-chain triglycerides. CoYo is my favourite brand – it’s dairy free and the natural flavour has only 3 ingredients: organic coconut milk, organic tapioca starch and vegan probiotic cultures. The only problem is that I like it as a frequent breakfast staple, but it’s an expensive habit – one small pot costs around £2. You can easily make your own coconut yoghurt instead, again with just 3 ingredients. It’s incredibly easy and tastes delicious. Plus it uses probiotics (of your choice) which are then allowed to ferment and multiply, so it’s a great choice for your gut. I’ve based this recipe on Hemsley + Hemsley‘s coconut yoghurt. 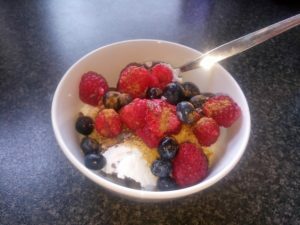 I like to enjoy it with berries, nuts or seeds, a dash of ground cinnamon and maybe even some cacao nibs. You will also need a 500ml glass jar, such as a Kilner jar, with a tight fitting lid. First sterilise the jar. You can do this by placing it in a large saucepan of water, bringing it up to boiling point, and keeping it boiling for 10 minutes. Pour the 350ml boiling water into a jug or mixing bowl. Take the creamed coconut out of all its packaging and submerge in the hot water. Leave for approximately 10 minutes, stirring regularly, until all the creamed coconut has melted and there are no lumps left. Allow the liquid to cool. When it is at body temperature, open up the probiotic capsules and pour the powder from inside them into the coconut mix. Add the vanilla extract and stir well. Close the lid and leave the jar in a warm place for 12-48 hours so that the contents can ferment. The time depends on the temperature (in the recent very hot weather my coconut yoghurt was ready after 12 hours, but 24 hours or more is typical). You can leave it on a warm windowsill out of direct sunlight or even in an airing cupboard. If the jar is very full, you may find that some coconut yoghurt starts to bubble out of the top, so rest the jar on a plate to prevent a mess! You can open the lid to taste the yoghurt to see if it is to your liking. The longer you leave it, the tangier it will taste. It should be semi-solid.